I’ve been writing copy for these “special sections” since 1992 so you’re getting a seasoned and experienced writer to create this valuable content. 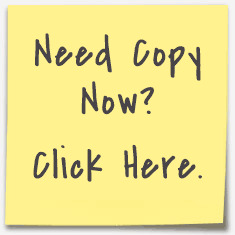 I conduct the research quickly and write the copy quickly so you get the advertorial on time. Experience…I’ve published more than 7,000 pages of content for print and web. I’m a copywriter—so I write advertorials to get the reader to take the next step in the sales process. Sensible rates so you stay within the budget. Copy will need very little editing so there's no need for revisions. I represent your publication/website professionally if you need me to contact the advertiser. Contact me here to discuss your advertorial projects. Call (704) 517-0241 or Skype: ScottMartin22.